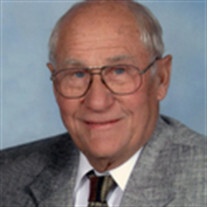 Obituary for Robert Norman DeDoes | Langeland Family Funeral Homes, Inc.
Robert Norman DeDoes went home to be with his Lord and Saviour on February 17, 2018. Bob was born January 30, 1930 in Kalamazoo, the son of John and Jennie (Greendyke) DeDoes. He was a partner with his brother Ted in operating DeDoes Construction for many years until his retirement in 1985. He was also a realtor with Bosch Realty. Bob enjoyed volunteer work with many Christian Organizations throughout the world and with a group called SOWERS. For 10 years, he volunteered for Wycliffe Bible Translators. He was a member of Texas Corners Bible Church. Bob was married to the love of his life Mary Westrate for 66 years. Family was a very important part of his life, he was very proud of his children, grandchildren and great-grandchildren. Surviving in addition to his wife Mary DeDoes are five children Brenda Buiskool, Brian (Linda) DeDoes, Bonnie (Robert) DeVries, Bradley (Julie) DeDoes, Beth (Darrell) Wagaman; 13 grandchildren; 12 great-grandchildren; siblings Stanley (Betty) DeDoes, Jake (Sue) DeDoes; sister-in-laws Ardis DeDoes and Lois DeDoes; several nieces and nephews. Bob was preceded in death by his parents and siblings Nellie, Nathan and Adrian. A private burial has taken place in Mt. Ever-Rest Memorial Park North. A Memorial Service will be held at 11:00AM on Saturday March 24th at the Texas Corners Bible Church (7780 South 8th Street), with Pastor David Thompson officiating. The family will receive friends at the church from 10:00 to 11:00AM and immediately following the service during a time of food and fellowship in the church hall. Memorials in Bob's memory may be directed to Texas Corners Bible Church or to Hospice Care of Southwest Michigan.